120 mm/45 Vickers-Terni 19244 х 2 pcs. 533 mm tubo lanciasiluri DAAN-Whitehead2 х 2 pcs. 13.2 mm/76 Breda 19312 х 2 pcs. 40 mm Vickers2 х 1 pcs. 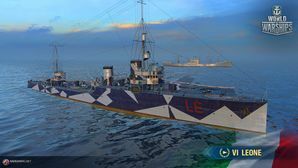 Leone — Italian Tier VI destroyer. A very large destroyer in comparison with her contemporaries, officially classified as a "light scout" for a long time. One of the ship's features was 8 main battery guns placed in 4 twin mounts. The Leone class were a group of destroyers built for the Italian Navy in the early 1920s. Five ships were planned and three completed. All three ships were based at Massawa, Eritrea during World War II and were sunk during the East African Campaign. This page was last modified on 10 January 2019, at 20:02.